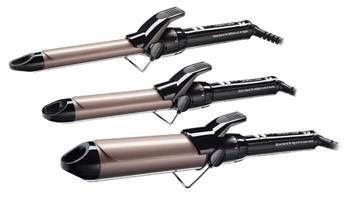 VS Sassoon launches a new rannge of Ceramic Curlers in three different barrel sizes. Now you can match the styler to the look. Choose the 19mm barrel curler for defined curles and ringlets, the 25mm barrel curler for medium curls and bounce or the 38mm barrel curler for big curls and loose waves to make styling effortless. Enjoy faster styling and longer lasting curls. If you want to create your favourite curl styles fast, fabulously and affordably (it's a true premium range without the price tag) then look no further than this new Ceramic Curler range from VS Sassoon. Delivering not only instant heat (glam on the go! ), but up to 25% more heat than previous models, this range is all you need for fast, frizz-free shiny curls. A fast & easy to use 10 setting temperature dial so you can adjust the heat up to 180â°C depending on your hair – go high for thick hair and lower for fine. Ceramic finished barrel for high shine and reduced frizz. Counter rest – to protect surfaces. Auto cut off for added safety. Cool touch tips for comfortable control.